Edited by Ferdous Rastgar Jazii . With particular distribution in the world and hundreds fold variation in the incidence rate between the high and low risk regions it is well established that both environmental factors as well as genetic predisposition are involved in tumorigenesis of esophageal cancer. As a result environmental, nutritional, habitual, and socioeconomic factors, as well as cell and molecular alterations have to be subject of investigations in the etiology of this type of cancer. At molecular level, while a large number of alterations have so far been proposed for esophageal carcinogenesis, however several specific events were attributed to be more significant and key players of the role in the process of esophageal carcinogenesis. These events are specific molecular mechanisms and pathways involved in the regulation of the both oncogenes and tumor suppressor genes. The present book covers recent achievements in the cell and molecular, nutritional, in addition to clinical features of esophageal cancer. The first two chapters of the book describe fundamental features including genetic, cellular and molecular aspects of esophageal cancer. Chapter three and four have aimed candidate molecular markers of esophageal cancer. Chapter three describes the present molecular marker in addition to the role of stem cell biology in the identification of biomarkers. Chapter four has focused on the application of proteomic in the etiology and identification of tumor markers regarding esophageal cancer; the present identified marker and future prospects. Chapter five and six have oriented toward dietary and metabolic pathways. In chapter five our present knowledge of structural and functional features of retinoic acid and effect of ethanol metabolic pathway on retinoic acid supply in pathogenesis of esophageal cancer is discussed. Chapter six has focused on a long term case-control cohort study on the role of different nutritional factors, minerals, vitamins in esophageal cancer. 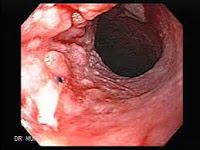 The last five chapters are dedicated to the clinical features of esophageal cancer. Chapter seven and eight have focused on the histo-pathological features, diagnosis as well as current therapies of esophageal cancer and chapter nine on the application of recent achievements in the cell and molecular biology based targeted cancer therapy. Chapter ten and eleven have briefly focused on the two especial features of esophageal cancer which have received less attention in the literatures. In chapter ten a case report of primary malignant melanoma of the esophagus (PMME), a rare disease diagnosed in the advanced stage years after the first diagnosis is discussed and finally the last chapter has focused on the importance of recognition and monitoring Extravascular Lung Water using PiCCO system during preoperative managements of esophagectomy with extensive lymph node dissection for thoracic esophageal cancer.